A U.S. Navy transporter carrying 11 people crashed into the Pacific Ocean off Japan on Wednesday. Search and rescue is underway for survivors, the Japan-based Seventh Fleet said in a statement. As of Wednesday morning, eight people had been rescued and were in “good condition,” The Washington Post reports. 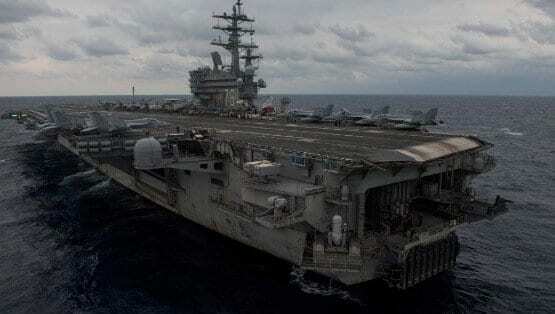 The crash happened while the plane was traveling to the USS Ronald Reagan aircraft carrier, and the cause remains unclear. This is the latest in a series of accidents for the Seventh Fleet. In June, seven sailors died when the USS Fitzgerald hit a container ship. And in August, 10 people were killed when the USS John S. McCain collided with an oil tanker. Both incidents were considered avoidable and blamed on crew negligence. BREAKING: US Navy says aircraft with 11 people aboard has crashed in Pacific Ocean on the way to aircraft carrier Ronald Reagan. This entry was posted on November 22nd 2017 at 10:49am/10:49 and is filed under Live News Column 1, Transportation. You can follow any responses to this entry through the RSS 2.0 feed.